Posted April 29, 2013 by greendog & filed under diet and health, GMO ingredients, Green Tip, pet food ingredients, soy. As a Green store, we of course are dedicated to sustainability, but that can be a real challenge with pet food. The larger a company is, the more difficult and expensive it is for them to source the most sustainable ingredients on a large enough scale to meet national demand. One might expect that we would source only Organic foods, but this is more of a challenge than you might expect – many pet foods that are certified organic are not, in our opinion, necessarily suitable nutritionally for carnivores; organic meats are expensive, and often a very large percentage of the protein is derived from less expensive organic grains. Sometimes we have to make tough choices for sustainability reasons. We dropped one line of “organic” pet food (Castor and Pollux – years ago, before they sold to Nestle) because we found out that they were using farmed salmon in their foods, one of the most ecologically harmful, least organic ingredients you could use due to a variety of impacts, such as enormous amounts of antibiotics and other chemicals used, concentrated fish waste polluting the water, and are a big risk to wild salmon populations due to disease transfer and interbreeding when they escape their pens. More importantly for our pets, they are so high in PCBs that humans are recommended to not eat farmed salmon more than once a month due to risk of cancer. What about much smaller animals that eat it every meal of every day? We don’t like traditionally farmed salmon, and we were upset that a food that touts the benefits of organic foods (as more humane to the animals, more sustainable, lack of chemicals used to raise/grow products, etc) would not stand up publicly against this very un-organic ingredient, let alone allow it in their foods. Wild salmon itself isn’t a very sustainable choice for use in pet foods already, but we draw the line at farmed salmon. Sourcing: We try and find as many companies as we can that use pasture-raised or at least antibiotic and hormone free meats, as well as those that use sustainable fisheries and cage free chickens with enough room to move freely. Commercial raw foods for pets almost always score higher in sustainability – Some of our most sustainable foods are found in our freezers; brands like Answers Pet Food, Small Batch and Primal are some of our favorites, as they use thoughtfully sourced ingredients like humanely raised, pastured (grass fed and grass finished) meats, and organic fruits and veggies, and the last two are produced in or near Portland. Sourcing your own food and your pets’ food as locally as possible definitely increases the sustainability factor, as products that travel smaller distances use fewer fossil fuels in their transport. GMO ingredients are more and more pervasive though both in human foods and pet foods, and are very difficult to avoid, especially because they are not labelled. We realize that they of course occur in many commercially made foods, so it is impressive when a company steps forward to make foods that are largely or entirely GMO free. 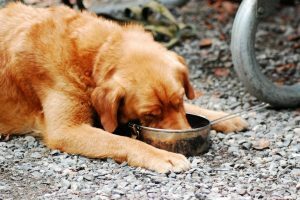 Some kibble companies that are doing a good job with this are Open Farm, Pulsar, and Farmina, We’re starting to see more and more discussion of this in the pet food world, and we of course are pleased at this development. They of course are not legally allowed to label their foods as such. Remember that most GMO ingredients come from grains (especially corn, soy, and canola) as well as Beet Pulp. Genetically Modified Organisms (GMOs) refer to plants and animals with an altered genetic make-up. GMOS are created by changing an organism’s genetic composition by artificial means, often involving the transfer of specific traits, or genes, from one organism into a plant or animal of an entirely different species. According to Gracelinks.org, nearly 400 million acres of farmland worldwide are now used to grow GE crops such as cotton, corn, soybeans and rice. (as of 2013 when this Green Dog article was first published) In the United States, GE soybeans, corn and cotton make up 93%, 88% and 94% of the total acreage of the respective crops. The majority of genetically engineered crops grown today are engineered to be resistant to pesticides and/or herbicides so that they can withstand being sprayed with weed killer while the rest of the plants in the field die. Proponents claim genetically engineered crops are designed to use fewer pesticides than non-GE crops, when in reality GE plants can require even heavier use of chemicals. This is because weeds and insects can and do become resistant to pesticides, leading farmers to spray an ever increasing volume of chemicals on their crops, and eventually are having to resort to more and more toxic chemicals to fight these “superweeds” and “superbugs”. 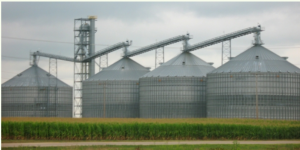 This pollutes the environment, depletes the soil, exposes food to higher levels of toxins, and creates greater safety concerns for farmers, farm workers, and people living adjacent to these farming operations. Pollen from GMO plants can spread and contaminate other crops (a real risk for organic crops). There have been very few credible studies on GM food safety. Nevertheless, the available findings already give cause for concern. Opinion polls show that up to 90% of Americans want GMO ingredients to be labeled as such, but so far, efforts in the U.S. have failed. Many other countries in the world (more than 60) have already passed laws labeling GMO foods for the consumer. Meanwhile, our country just passed the Monsanto Protection Act, effectively protects biotech companies Like Monsanto from federal courts should any evidence come to light about negative health side effects to the crops. * Ask your food company what they are doing to avoid GMO ingredients. * Choose Certified Organic products – USDA regulations prohibit organic foods from containing GE ingredients, and organic meats cannot come from animals that were fed GE crops. So eating organic is a surefire way to avoid GE foods. We are of course sensitive to the concept that a carnivore’s carbon footprint is larger than that of an herbivorous pet, and we encourage those that are concerned with sustainability to consider making diets at home using locally grown and humanely raised and slaughtered meats and produce from local farms, or perhaps using wild caught fish from sustainable fisheries and using supplements like fresh local eggs and raw goat’s milk. Look for foods that use Certified Humane meats. Factory farming methods are not only inhumane, but they create massive amounts of waste. Open Farm kibble was the first dry diet on the market to use entirely certified humanely raised meats. Their fish species are rotated frequently depending on the health of the fisheries, so frequently that they print the species they’re using near the date code as it changes. They also will take your bags back for recycling and turn them into things like toothbrushes. Answers Pet Food uses certified humane, organically fed meats and organic fruits and veggies. Tiki Cat is another brand that chooses more sustainable populations of fish and less destructive fishing methods. Farmina Pet Food sources ingredients from Europe, so are guaranteed to be GMO free and not factory farmed at this point. Ask questions of the company you like – are they using farmed fish? Definitely avoid this! Are they sourcing antibiotic/hormone free meats? Cage Free chickens that have space to move or eve n access to the outdoors? Are pigs able to move freely and express natural behaviors? Are they making an attempt at avoiding GMOs? Small changes in sourcing can add up, and simply asking a company these questions can create awareness on their part that their customers are looking for more sustainable options. The truth of the matter is that meat is not a very sustainable food, but it’s very important to remember that when you are feeding dogs and cats, you are feeding carnivores. Feeding a species the way they were designed by nature to eat will absolutely result in a healthier animal, and will cost you much less in vet bills and heartache. 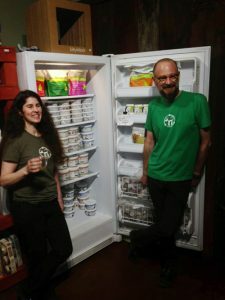 At Green Dog we believe that humans have the biological flexibility to thrive on plant based diets, and that avoiding or simply even reducing the amount of meat that you eat (and when you do eat meat, choosing meats that were farmed more sustainably) can really act as good “carbon credits” towards the responsibility of caring properly for the carnivores in your family. JustLabelIt This coalition strives to educate consumers about GE foods and to urge the FDA to label GE foods. One of the craziest things happening in the GMO debate right now: we are on the verge of the approval of the first Genetically Modified animal: salmon that have been genetically altered to grow twice as fast. Act today to tell the FDA that it is unacceptable to approve this project without reliable safety testing and more complete research on environmental impact. If nothing else, it’s an enormous risk to wild salmon populations. (Note: these were approved for sale in 2016 – yet another reason to avoid farmed salmon).